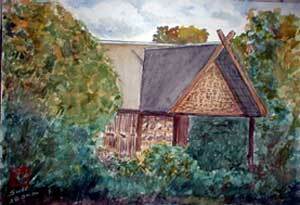 This is a painting of a very old house, now abandoned. The vegetation must have swallowed the structure by now. It is a simple timber structure with flat zinc roof. I was trying to capture the mood of the evening with the yellow tints on the trees and shrubs. Have not been very successful, I think. Anyway, this was done in May 2004.